iBall Andi4 IPS Tiger has been launched at price of RS6299. The new Andi 4 IPS Tiger comes with entry level specifications and features. It would compete with Karbonn Titanium S1 Plus and Videocon A29. The Andi-4 Tiger has a 4 inch 480 x 800 pixels WVGA display and 1.3GHz quad core CPU. It is a DUAL SIM Phone and has 512MB of RAM. It houses a 1300mAh battery and is accomplished with 5MP rear camera with LED flash. It offers 3G BT, WiFi, GPS, FM Radio and micro USB connectivity. The internal storage is up to 4Gigs and further you can expand the memory up to 32GB via SD card. 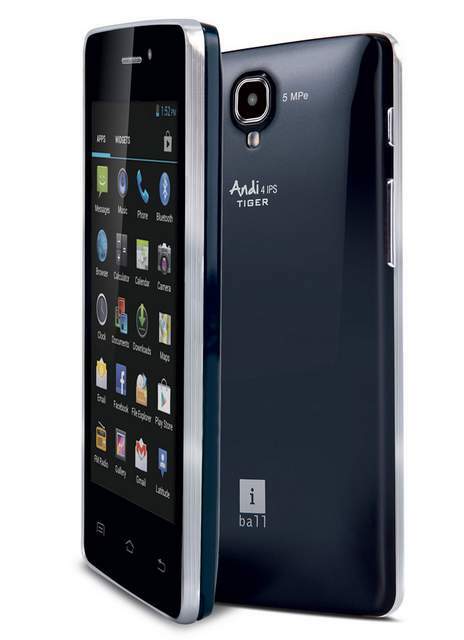 The iBall Andi4 IPS Tiger is available in Black color. You can buy it from Ebay India for price of INR 5799. The main cons in the phone are battery life and low RAM. Around the same price you can BUY Micromax Unite 2 A106 with 1GB RAM and Android 4.4 Kitkat OS.